Industrial roundwood: 2,175,000 m3 o.b. Wood fuel: 10,370,000 m3 o.b. Côte d'Ivoire has the highest level of biodiversity in West Africa, with over 1,200 animal species (232 mammals, 702 birds, 125 reptiles, 38 amphibians, 111 fish) and 4,700 plant species. Most of this diversity occurs in the rugged interior region and not in the coastal regions as is the case in other parts of West Africa. 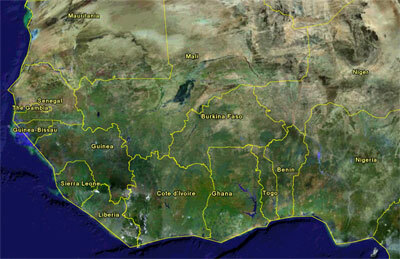 However, much like the rest of West Africa, Côte d'Ivoire has suffered severe deforestation. As of 2005, less than 2 percent of the country's land area was covered with primary forest, while less than a third of Côte d'Ivoire was forested at all. Agriculture, uncontrolled fires, and logging for tropical woods —once Ivory Coast's largest export by volume—were the primary causes of forest loss. Since winning independence from France in 1960, Cote d'Ivoire's forested area has fallen from around 16 million hectares to 10 million hectares. Once the darling of West Africa with its economic miracle of the 1980s, the country by the 1990s had collapsed because of resource depletion and declining agricultural productivity. The situation has only worsened since then and civil war has plagued the country since the end of 1999. Prior to the outbreak of war, the Ivorian government worked to make conservation a priority, setting 17 percent of the country aside in protected areas and taking measures against illegal logging, poaching, and settler encroachment in parks. The government banned raw-log exports and encouraged the development of forest plantations, while deforestation rates plunged. Between 1990 and 2005, Côte d'Ivoire lost only 1.8 percent of its forest cover. Today the status of conservation efforts in Côte d'Ivoire is unclear. If neighboring Liberia is any indication, it is likely that Côte d'Ivoire's ecosystems will further decline. Contact me if you have suggestions on other rainforest-related environmental sites and resources for this country. an organization working with Afro-indigenous and Embera communities to protect forests in Colombia's Darien region. Anthrotect is protecting the habitat of mongabay's mascot: the scale-crested pygmy tyrant.